Facial features combine to the give the appearance an aesthetic appeal. When one area is out of proportion, a look will be unbalanced. The lips are a vital feature that sets off the rest of the face; when overly big, they can take away from an otherwise elegant appearance. A lip reduction is a state-of-the-art outpatient procedure designed to bring the lips into proportion with the other facial features, accentuating the face instead of distracting attention. The source of large lips can include genetic/race, congenital defects, an injury to the lips, as well as a previous and poorly executed lip augmentation. Your lip reduction surgery in our New York City surgery center will be tailored to fit your needs and desires as the patient, taking into account the form and dimension of other facial features. Am I a Good Candidate for Lip Reduction? The best candidate for lip reduction are individuals in generally good health and with realistic surgical expectations. 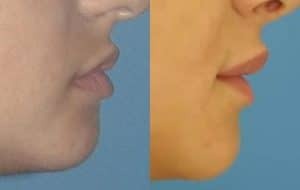 Patients dealing with overly large lips that are out of proportion with other facial features, for any reason, can make excellent candidates for the procedure. A consultation appointment with Dr. Miller will be set up before scheduling the surgery so that he can determine if a lip reduction is a right procedure for your individual needs. Dr. Miller will perform the lip reduction procedure in his office surgical suite in New York City. The procedure will take between 15 and 30 minutes to complete, using a light sleep anesthetic; although this can change should an additional procedure be included. First, Dr. Miller will apply a local anesthetic to the lips. An small incision will then be made across the inner lip. From here, excess tissue and fat will be excised. Finally, the lip will be sutured for appropriate healing. A lip reduction may be performed alone, or it may be paired with another cosmetic procedure to produce optimum results. Patients can find satisfying results by including a rhinoplasty, cheek augmentation, or a facelift. While lip reduction is considered a safe and efficient procedure, like any type of surgery, there remains a very small chance of complications. Utilizing a board certified surgeon like Dr. Miller greatly reduces the chance for any problems after a lip reduction. Although rare, complications can include infection, poor healing, scarring, or asymmetry. Patients should expect the recovery from a lip reduction to take about two weeks. Initially, there may be mild discomfort, swelling, and bruising; these diminish over the first several weeks following surgery. Temporary numbness or tingling of the lips is common. Patients should keep their head elevated for the first few days, and refrain from any vigorous activities. A soft diet is often required for several days, while the lips begin to heal. Normally, patients feel well enough to return to work or school in two to three days. Q: How much does a lip reduction procedure cost? A: Depending on the extent of correction, the cost can vary. It is best to come in for a consultation to determine the actual cost. Q: How do I prepare for a lip reduction procedure? A: After your consultation with Dr. Miller, look over his post-operative instructions. Contact our office in New York City if you have any questions or concerns. Fill prescriptions for pain medication early and arrange for rides/assistance, should it be required. A: The recovery from a lip reduction will take approximately a week. During this time, most of the swelling and bruising will diminish. Patients will feel well enough to return to work in five to seven days. Q: How long does it take to perform a lip reduction surgery? A: Lip reduction generally takes between 15 and 30 minutes to complete. Next, learn about the Micro Lift.